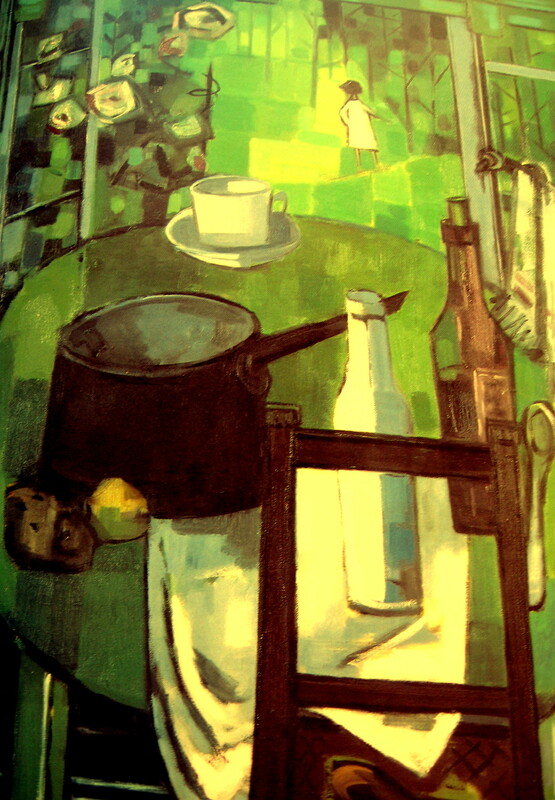 This is “Garden Green,” an oil on canvas, (1962) which is on display at the Hugh Lane Municipal Gallery of Modern Art, in Dublin. It was painted by the Irish born artist and illustrator, Norah McGuinness. The beauty of “Garden Green,” is that it incorporates two prevalent aspects of Norah’s art – her focus on still life portraiture, whilst encompassing the dramatics of the natural outdoors, often favouring the colour of nature’s greenscape. Norah, who was born on 7th November 1901, in Derry, Northern Ireland, moved south to the Republic in 1921 to study art at the Dublin Metropolitan School of Art and later, at the Chelsea Polytechnic in London before spending the 1920s working in Dublin as a book illustrator and stage designer. Her first commission was a set of illustrations for Laurence Sterne’s “Sentimental Journey”. She married, book editor Geoffrey Phibbs, but they later divorced in 1929. The same year she followed the advice of Mainie Jellett and travelled to Paris to work at the studio of André Lhote. According to Wikipedia, from there, Norah moved to London where she was a member of Lucy Wertheim’s “Twenties Group” followed by the avant-garde “London Group”. Norah then travelled and lived in New York from 1937 to 1939 and once more returned to Dublin where she continued with her art. Her preference was to paint vivid and highly coloured landscapes, which had a certain Cubist influence. Norah helped found the “Irish Exhibition of Living Art” in 1943 and became its president in 1944, after the death of Mainie Jellett. Although Norah was elected an honorary member of the Royal Hibernian Academy in 1957, she resigned. Norah died on 22nd November, 1980, in County Dublin. This entry was posted in Gallery Art, OilPainting, Paintings and tagged #Dublin, #IrishArt, Cubist art, Garden Green, Norah McGuinness'. Bookmark the permalink.